Like most Americans, I'm in the middle of Christmas shopping. One of the items my son mentioned needing was a new pair of work boots. As I'm looking around online at various sites, one thing started to jump out at me as I became aware of it on a number of boot listings I was finding on name-brand sites. 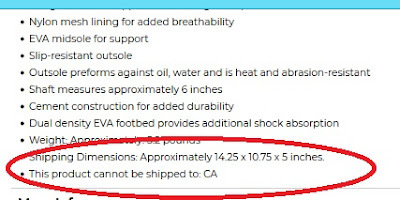 They won't ship to California. 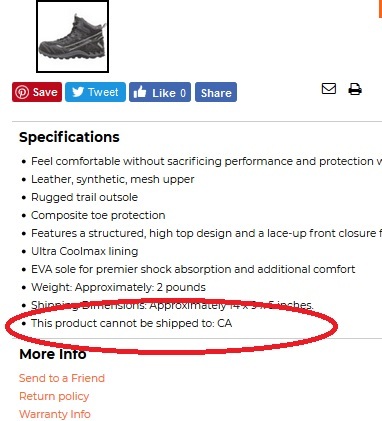 Many .com sites and boot makers aren't shipping to California because of their Prop 65 law and the steep penalties involved. As I paid attention to this a little more today and continued shopping for some other items I found it listed on items such as body lotion and skincare product sites, perfumes, water filters, air filters, lamps (due to an energy consumption law), some home decor, hiking boots, 3D printer filaments and more... oh so much more. What I found funny-not-funny about this is that I used to LIVE in Southern California. 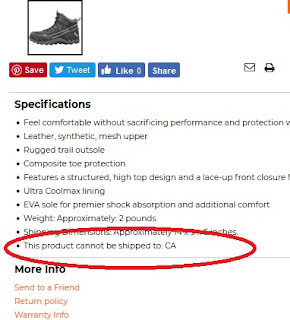 They won't allow you to buy a pair of work boots online and have them shipped to you without penalties to the manufacturer, but I used to stand in the doorway of our home, not far from orange groves, and watch the planes and helicopters spraying malathion on the fields. As the cancer-causing pesticide drifted in the air, I could smell it so I knew I was breathing it. California is OK with malathion spraying but don't you dare try to buy and have delivered a pair of boots or certain body lotions from the Body Shop!